CoQ10 is a fat-soluble substance which is difficult for the body to absorb. However, thanks to a highly specialized manufacturing process where CoQ10 is dissolved in a vegetable oil solution and exposed to a patented heating process the CoQ10 crystals are able to dissolve entirely into single molecules at normal body temperature. Bio-Quinone CoQ10 has undergone a special heat treatment that changes the crystal structure to something similar to "snowflakes" at room temperature. One (1) softgel capsule 1 to 3 times daily or as directed by your qualified healthcare professional. To be taken with a meal. Pregnant and lactating women and those on medication should consult their healthcare professional before use. Room temperature and out of direct sunlight. Keep out of reach of children. Use by date printed on flap. The Q-Symbio study is a large, international clinical trial, which examined the importance of CoQ10 supplementation. Pharma Nord supplied 100 mg CoQ10 softgel capsules for the clinical trial. The Q-Symbio study results were published December, 2014 in The Journal of American College of Cardiology (JACC). Since Q10 is a fat-soluble substance, it is important to take it with a meal that contains some fat. If you already take a daily fish oil supplement, it will benefit the absorption of Q10 from the gut to take your Q10 supplements with the fish oil. The effect is observed after a short-term use and is felt most acutely approx. 6 hours after ingestion. Therefore, Q10 should most effectively be taken with breakfast, perhaps lunch. If you take more than 1 capsule of ubiquinone per day, the absorbability will be larger if you spread the dose throughout the day – i.e. 1 capsule at breakfast and 1 capsule at lunch time - rather than taking the entire daily dose at once. CoQ10 product's ability to be absorbed from the intestine is one of its most important aspects. Ubiquinone of good quality has been found to be absorbed better than ubiquinol. 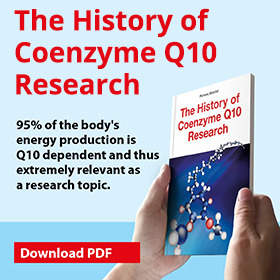 A few unsubstantiated reports suggest, however, that products with ubiquinol may be relevant to a very small percentage of people who have impaired uptake of CoQ10 from the gut.